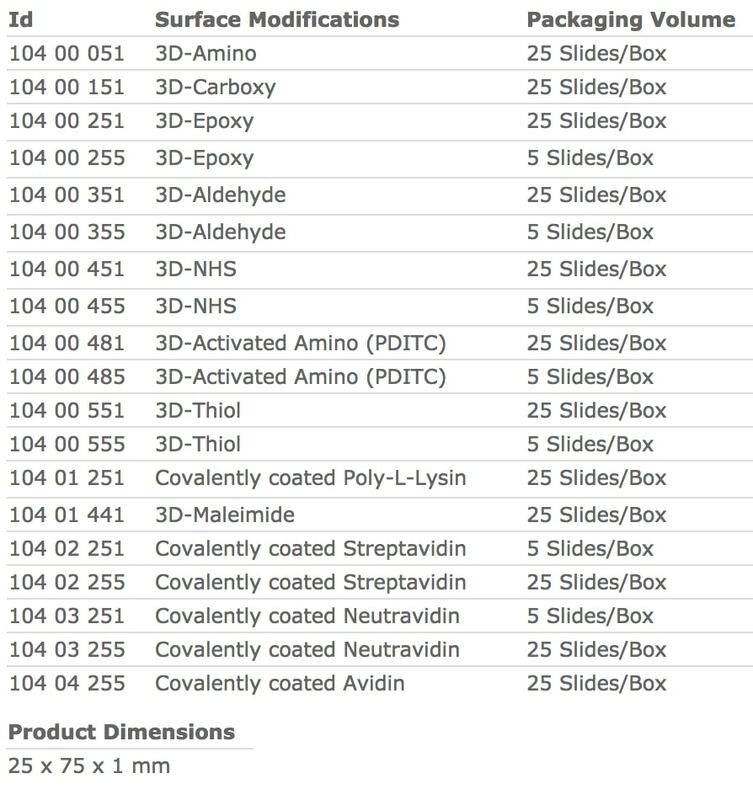 Especially for diagnostic applications, PolyAn is offering a broad range of functionalized microarray polymer slides. For reasons of reliability and bio-safety, patient-centric biomarker testing is always performed in single-use cartridges with a one-step process (sample in – result out). These cartridges should be disposable after use, so the materials of the cartridge should be non-hazardous and recyclable. 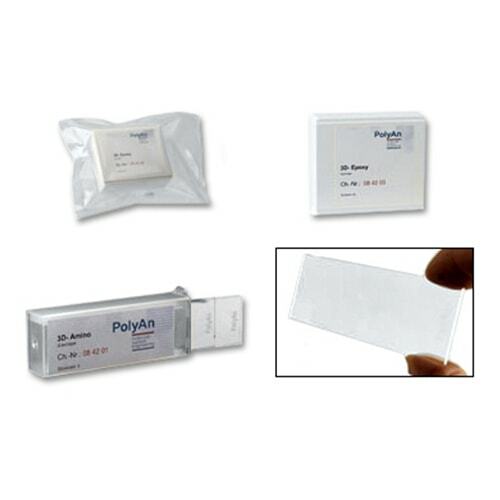 PolyAn’s Polymer Slides are comprised of a low auto fluorescence plastic. The material is highly robust against breakage making it the material of choice when working with hazardous materials. It is suitable for injection molding and hot embossing processes. The slides are produced with standard dimensions of 25 x 75 x 1 mm. Additionally, we offer the functionalization of your plastic including microfluidics with a surface modification that is tailored to your specific application. PolyAn’s 3D-functionalised microarray Slides are functionalized with a three-dimensional (3D)-surface chemistry comprised of a long-chain polymer containing a defined number of reactive groups. This polymer is covalently linked to the surface of the slide. Covalent binding of functional layer on the substrate without changing the initial autofluorescence. Combination of reactive functional groups with PolyAn antifouling matrix. hydrophilicity / hydrophobicity (contact angle). Narrow variation of surface properties and homogeneous distribution of reactive groups. Morphology and thickness of functional layer tailored to the desired application. The slides are packaged in inert atmospheric boxes, with a capacity of 25 or 5 slides per box. PolyAn’s slides are characterised by a long shelf-life when stored dry, at room temperature and protected from sunlight. All slides are packaged in boxes under Argon atmosphere to avoid contamination with particles. The Argon atmosphere also minimises degradation of the reactive surface through contact with air or humidity.